October is almost over. And so is my 31 Days of Dance Challenge. There are nine days left. You know what I'll be doing for the next nine days. You should totally join me. Come on and dance! Here's a mash-up of some of the dancing from the last 22 days. Here is some dancing trivia about me. I once danced in the middle of a mall to Irene Cara's song "Fame." I distinctly remember looking into the faces of the scattered onlookers wagging my finger and lip syncing like I was Irena Cara "Remember my name! Remember. Remember." I was 7 years old. I wanted to be a Solid Gold dancer when I grew up. I quit my promising dance career when my parents got divorced when I was 12. I sort of quit everything (band, softball, getting good grades) and listened to cassette tapes of Ratt a lot. Waaaa. I've never met a dance floor I didn't like. At my wedding reception, I skipped the formal wedding party dance where the bridesmaids dance with the groomsmen. Instead, I dedicated Tina Turner's "Proud Mary" to my bridesmaids and we all danced our hearts out together. 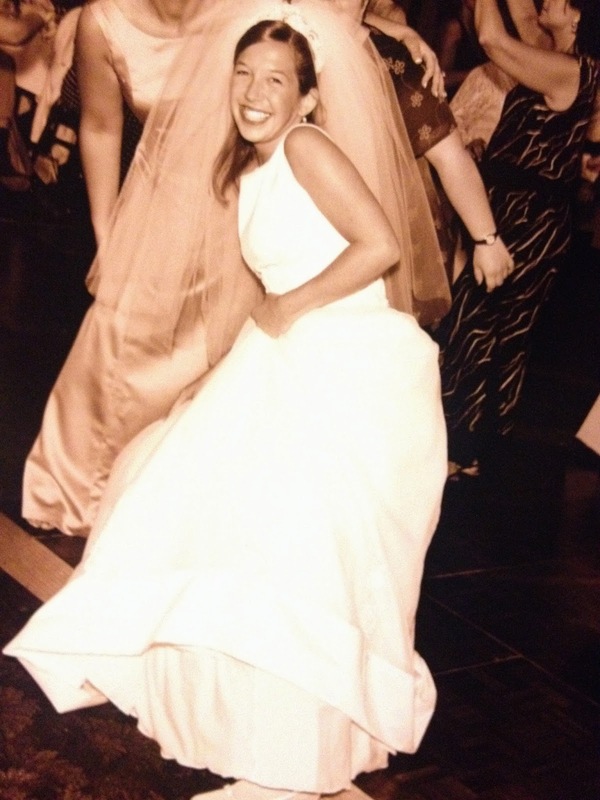 Rocking out on the dance floor at my wedding almost 15 years ago. Tim can't dance. He won't dance. When I first met him I didn't believe it, but then I saw him try once and we agreed he'd never have to dance again. We have been together for almost 17 years and he has always supported my dancing, and I have supported his non-dancing. Dancing is a release, it is self-expression, it is free, it is free-ing, it is an escape, it is fun, it makes me feel alive. One of my favorite all-time things to do is get a dance floor started at an event (i.e. wedding, charity event). I'm thinking about having cards made up that say "Professional Dance Floor Starter."